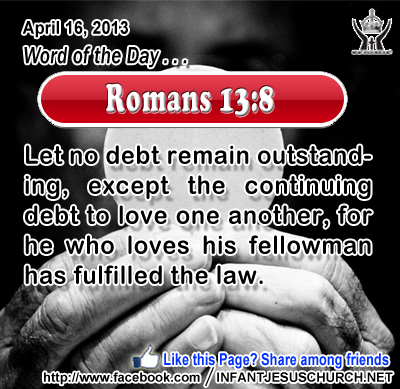 Romans 13:8: Let no debt remain outstanding, except the continuing debt to love one another, for he who loves his fellowman has fulfilled the law. Heavenly Father, who owns all things, we thank you for not just owning us, but for having bought us out of slavery, sin, and death. Please kindle love in our heart through the Holy Spirit so we will love others as you do. In Infant Jesus' name. Amen. 30So they said to him, "Then what sign do you do, that we may see, and believe you? What work do you perform? 31 Our fathers ate the manna in the wilderness; as it is written, `He gave them bread from heaven to eat.'" 32 Jesus then said to them, "Truly, truly, I say to you, it was not Moses who gave you the bread from heaven; my Father gives you the true bread from heaven. 33 For the bread of God is that which comes down from heaven, and gives life to the world." 34 They said to him, "Lord, give us this bread always." 35 Jesus said to them, "I am the bread of life; he who comes to me shall not hunger, and he who believes in me shall never thirst."